The newest generation of ADR SD Flash Card Duplicators outperforms the competiton through excellent copy speeds and compatibility with all SD and MicroSD cards on the market. 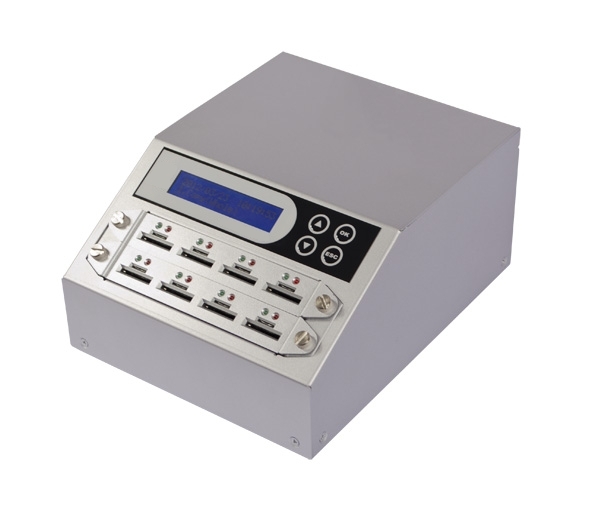 The NG series facilitates fast and accurate high-quantity reproduction of your Flash Cards. Data accuracy is ensured through the bit-by-bit "Copy & Compare" which checks the copied data for errors. The new compact design not only has a smaller footprint but also increases the ease of Flash Card insertion and removal. Make use of the extensive Flash Media quality check function to ensure that you are working with good batches of Flash Cards. The new Quick Socket technology allows fast and easy replacement of individual worn or damaged sockets, increasing long term throughput significantly versus other models on the market. All products of the NG Series are delivered with "PC-Link" software for optional operation via PC, real-time monitoring and log report generation to improve production management. For this purpose the SD Producer Flash Card Duplicators can be connected to a PC via USB. This way an array of information such as size of master and targets, writing speed, progress and many more is displayed on your PC screen. Please note that this feature is optional. No PC is required to operate the Flash Card Duplicator. 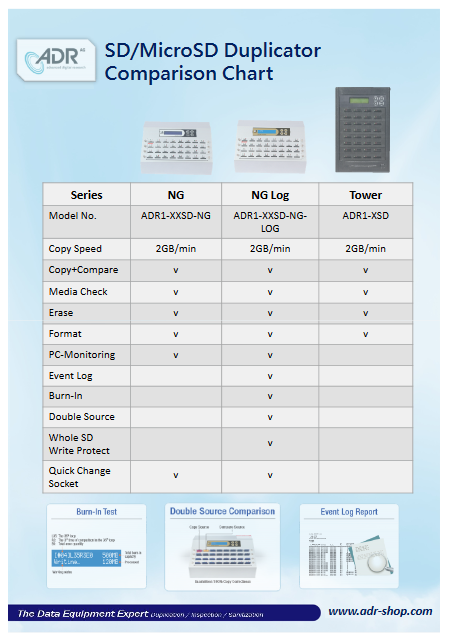 The NG Serie by ADR AG can from now on be supplied with an optional Log Report upgrade. This optional feature enables the creation of individual reports recording all operational details regarding your copy processes. 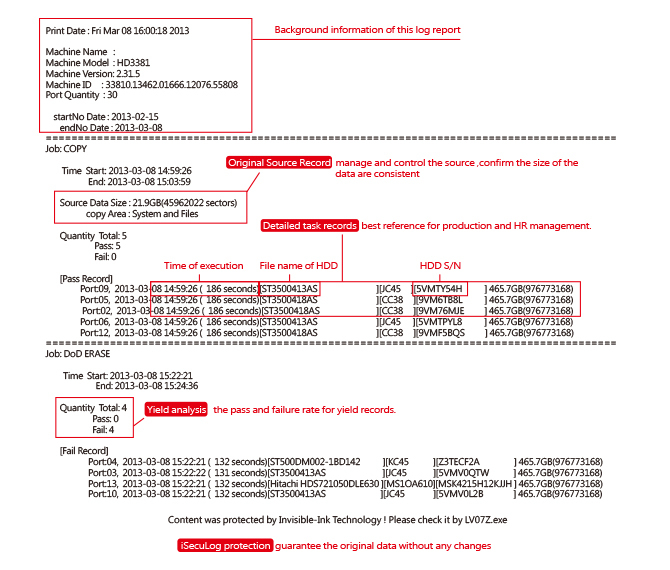 These log reports can be saved in your internal data base or printed out and supplied along with the copied Flash Media for enhanced production management. Simply insert the SD Card you wish to copy into the first port and place the desired number of blank SD Cards into the remaining free ports. Now hit "Copy" and that's it. Up to 55 copies (depending on your model) are created simultaneously. ADR SD Producer NG Flash Duplicators use an internal multi-core processor and controller and therefore work completely autonomously, not requiring a PC to operate. All that's needed is a power supply. Status messages as well as real-time information about your copy progress are displayed on the LCD display. To ensure data accuracy, you can make use of the extensive bit-by-bit compare function. User-friendly operationd and intuitive user interface with LCD Display and 4 buttons. Due to constant Flash card price and currency fluctuations, we encourage you to inquire about individual offers to suit your needs in terms of quantity and brand.